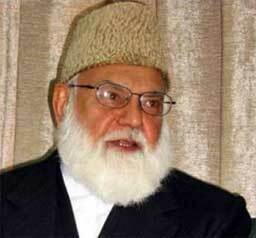 ISLAMABAD (Pajhwok Afghan News) – Former Jamaat-i-Islami (جماعت اسلامی) leader Qazi Hussain Ahmad (قاضی حسین احمد) died of a heart attack at the age of 74 years in north-western Pakistan, his son said on Sunday. With a cardiac complaint, the right-wing leader was admitted three days back to a private hospital in Islamabad, where he succumbed to a fresh attack, his son Qazi Loqman said. A son of Qazi Mohammad Abdul Rab, the ex-Jamaat-i-Islami head was born in 1938 in the Ziarat Kaka Sahib area of the Nowshera district of Khyber Pakhtunkhwa province. A religious scholar and Islamic theologian, he joined JI in 1978 and was elected as the party’s chief in 1987, a position he would be re-elected to on two more occasions before stepping down in 2009. His party had close links to Afghan Jihadi groups during the resistance against the Soviet invasion. He also opposed US operations against the Taliban and other militant outfits in Afghanistan. Many party workers and supporters from all over the country are converging on Peshawar to attend the funeral for the leader. President Asif Ali Zardari and Prime Minister Raja Pervez Ashraf offered condolences over the death of the veteran politician. According to Geo News, the venue of the funeral prayer for Qazi Hussain Ahmad was shifted to the Motorway Chowk on Ring Road from Jinnah Park in Peshawar.